The plan would ease the plastic crisis that sees half of 13 billion plastic bottles each year end up littered, in landfill or incinerated. A housing order means that British-farmed chickens have been cooped up in barns since last December - but that is set to change. 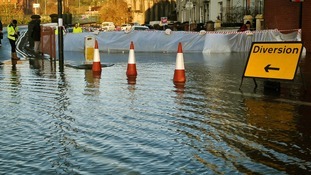 Ministers have been steering clear of flooded Somerset - but for how long? But after Prince Charles' visit, don't expect it to last. British scientists have applied to begin field trials of a genetically modified crop containing fish oil nutrients in its seeds in what could be a big boost to the fish farming industry. An application to conduct the trials at Rothamsted Research agricultural institute has been submitted to the Department for Environment, Food and Rural Affairs (Defra) and is expected to begin from April if endorsed. The scientists are bidding to produce the world's first sustainable plant source of fish oil omega-3 fatty acids by "cutting and pasting" genes taken from marine algae, which could help protect against heart disease. While the fish farming industry, which consumes 80% of fish oil supplies, stands to benefit from the trials, in the long term the GM-oil could also be included in food products like margarine. The Prime Minister has come under renewed fire over flood defence spending after it emerged that figures showing increased funding include money committed by the last government. David Cameron told the Commons last week that "in this current four-year period, we are spending £2.3 billion, compared with £2.1 billion in the previous period" on flood defences. But the current four-year period dates back 2010/2011 - the last year of spending commitments made under Labour when money for flood management reached a high of £664 million, before being reduced from 2011/2012 as part of the Coalition's spending cuts. Analysis by Friends of the Earth suggests the Government is spending £2.32 billion in the current spending review (2011/12-2014/15) period, slightly less than £2.366 billion in the previous four years.